It happens every year. People spend hours doing homework and weighing the options before finally dropping a sizable chunk of money on expensive new tech. And then, in keeping with the season, they give that gadget away in hopes of bringing joy into someone else’s life. This year, maybe it’s a shiny new iPhone X or a Nintendo Switch, gifts that anyone would be elated to receive. But as nice as those things are, even the most well-intentioned gift giver often overlooks the boring but important items that make those items really shine. So here’s a list of all the unsexy gifts that you should consider if you really want to make it a happy holiday. There’s nothing worse than getting a brand new camera and realizing you can’t save any pictures because you don’t have an SD card. But it’s not just cameras, because an SD or micro SD card can offer huge improvements to compatible Android phones like the Galaxy S8 or LG G6, and for people getting a new Nintendo Switch, it’s practically a requirement. That’s because even though Switch games aren’t super huge, the console only sports 32GB of onboard storage. And it’s not like SD card are very expensive either, as you can get 128GB card for around $30. And if you aren’t sure which type you need, just go for microSD, as almost all microSD card come included with full-size SD card adapters. Like it or not, we’re are living in a dongle world now. From headphone adapters to HDMI dongles, it seems like there’s always something that’s going to be hanging out of your smartphone or laptop. Thankfully, most phones that have axed the headphone jack come with an appropriate add-on in the box. However, if your recipient is someone who needs to charge their device while listening to music you’re going to need a dongle for that. Also, there are a handful of new laptops that only feature USB-C ports, which means you might need a dongle to hook up any legacy peripherals. But the most valuable dongle/adapter might be a display dongle, so you can more easily connect your laptop to a second screen. Thankfully, many dongles support multiple ports, which should help you pare down the number of accessories you need to carry around. Now that Apple has finally hopped on the bandwagon, wireless charging is something everyone needs to consider. It might not sound like much, but getting rid of one more cord and saving people from needing to plug in their handsets everyday is an underappreciated convenience. You can put one next to your bed and let your phone power up over night, or keep one at the office so you’re phone will be fully topped up the next time you need to run out the door. While Apple tosses a charger in the box alongside every iPhone, as our tests showed earlier this year, for those with an iPhone 8 or iPhone X, you can do a lot better. So this holiday season, give the gift of real fast charging by purchasing one of Apple’s USB-C to Lightning cables and a 29-watt adapter (or a similar, but less expensive third-party power brick like this one). Now, charging times will be cut in half. Alternatively, people on the Android side of things could probably do with an extra USB power cord or two. Maybe even check out some with a braided cable, which tend last longer than the ones that come in the box. During the holidays, there’s a good chance you’re going to be out and about visiting friends and family, and far from the convenience of a nearby outlet. That’s what makes a battery pack such a great gift, because it lets you do the things you normally do without fearing that your favorites devices will suddenly conk out. And if you get the right kind of pack, they can recharge everything from a smartphone to tablets and even a laptop. The main thing to looking out for is the kind of ports it has (you’re looking for both USB Type-A and USB Type-C) and total power output (usually listed in watts). Anker’s PowerCore+ 201000 is great for everything up to a Nintendo Switch, while Razer’s Power Bank can handle almost any laptop with USB-C charging. Most phones are pretty scratch-resistant nowadays. The only thing that is really going to mess up the display is fall hard enough to crack the screen, which a screen-protector really isn’t going to prevent. But a case might give a device a fighting chance, and if you spent the money to gift a brand new handset, the last thing you want to see if spiderwebs crawling across the screen just hours after they got it. That said, new Nintendo Switch owners should know that the Switch’s screen is plastic, not glass, and is incredibly prone to scratching. There have even been multiple reports of the Switch’s dock scratching its screen when the system is used in console mode, which makes a screen protector almost a required accessory. Just remember, if you want real protection, avoid flimsy plastic variety and go for a tempered glass protector like this one. These are for the person that got a new TV, sound bar and maybe a shiny streaming video box. All those new gadgets each need their own outlet, and few things are more frustrating than trying to set up your brand new movie room than realizing you can’t plug everything in. Tossing in a $25 power strip can save your friends and family from having to take an extra trip to the store, and it can help protect their devices from any unexpected power surges. Traveling is great, but the trying to figure out all the different power standards across the world, is not. So for the business person who’s constantly on the road of someone who just likes seeing new places, consider buying a handy international power adapter so friends and family can avoid the headache and enjoy their holiday. Even in a tech world filled with countless numbers of unnecessary smart devices and way too many products that do that same thing, routers are still boring as hell. But when essentially every device in your house relies on your router to send out high-speed wi-fi across the premises, you have to care. A good router will make streaming videos will look better, prevent lag in video games, and let people in the house do multiple things on the internet at the same time without throwing a fit. 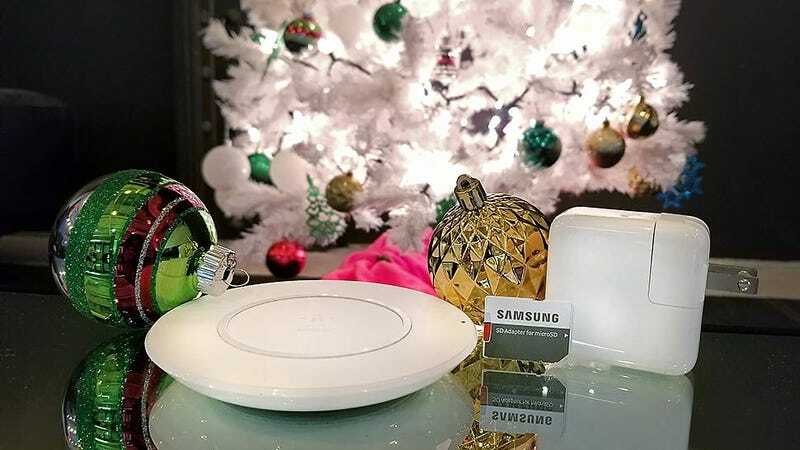 Routers are the definition of an unsexy gift, but it’ll be worth it in the end. A device is only as good as what you use it for. So if possible try to pair a new 4K HDR TV with some content that will really show off the set in all its glory. Think UHD Blu Rays of Blue Planet with its lush green forest and sapphire seas, or Blade Runner 2049 with its neon cyberpunk lights and gray, gritty streets. And what good is a Nintendo without Mario or Link, or a PC with PubG or Overwatch? If you want to be a true holiday gifting master, take the time to update your giftee’s brand new device before you give it them. We’re not living in the ‘90s anymore, when you could get a new gadget, pop in some batteries and start using it immediately. Pretty much any new phone, computer or smart device will need to go through a series of updates before you can actually use it, and depending on the item and the number of updates, that process could take hours. And if the item is a console, you can do even better by installing any games they may have gotten for them too. On Xbox One and PS4, even disk-based games need to be installed onto the hard drive before they can be played, so do it now and save your loved ones some valuable time later.